Three University of New Hampshire students in Brussels at the time of the attacks were not hurt, according to a school spokesperson. Junior Danielle Lewis spoke with necn via Skype from her temporary home in Brussels while studying abroad. She was inside the airport, exactly where the bombs exploded, just 24 hours earlier. "I have been there and it is just very freaky," Lewis said. The New Hampshire native lives less than an hour from the airport. She says after the attacks, everyone felt vulnerable, unsure of who might be next. "I was shocked," Lewis said. "I didn't expect it, I was very, very worried for Kelsey's family." Kelsey Avey is Lewis's roommate. She's from Michigan and also studying abroad. "It was extremely scary, frightening, unbelievable," Avey said. "The difference that not even five minutes makes." 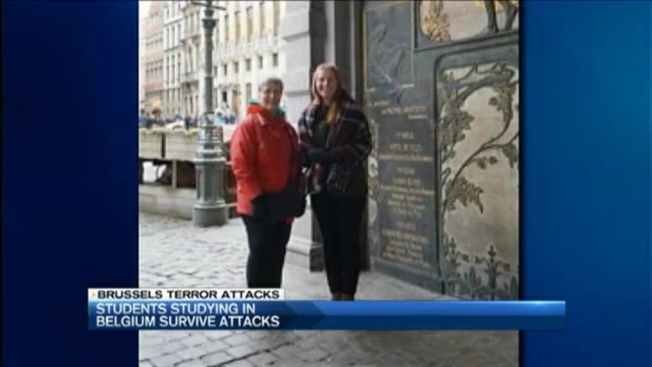 Avey's mom and aunt were catching a flight out of Brussels Tuesday morning. Her mom would have been in the exact spot of the blast, but something held her back. "As they were walking in, my aunt dropped her suitcase, so she had gone back to help her," Avey explained. That delayed them just enough that they felt the explosion, but didn't get hurt. "They heard two extremely loud explosions and immediately it looked like confetti flying around them," Avey said. "There was a huge gust of wind and it blew them back." Avey says they ran for their lives and when they were far enough outside the airport, they snapped a photo showing blown out windows and debris. "I am extremely grateful and happy and lucky," Avey said Wednesday. The two students will finish the semester in Brussels. Lewis' dad, back home in Manchester, is proud of that decision. "We know what happened in Boston - it could happen anywhere. It could happen here, in Manchester," Walter Lewis said. "We are not going to stop living our lives." Lewis and Avey say changing plans out of fear would allow those responsible to claim victory, and they refuse to let that happen. "I'm starting to love Brussels, and this isn't going to deter me," Lewis said. The students say these are days of quiet reflection in Brussels. Their thoughts and prayers are with the victims and their families.